When a dead whale washes ashore, it's a meaty bounty for whatever carnivores happen to find it. Researchers were surprised to find brown bears and wolves, two predators that don't usually get along, sharing a whale carcass for more than four months. And they have the photos to prove it. On May 5 2010, a 41 foot dead humpback whale washed onshore in Alaska's Glacier Bay National Park. Once the carcass was discovered, researchers Tania M. Lewis of the National Park Service and Diana J.R. Lafferty of the Carnivore Ecology Laboratory at Mississippi State University deployed a few camera traps nearby to see how the massive beast would be consumed. One camera took a photo every 15 minutes for 90 days. The second one was triggered by a motion sensor. Together, the researchers had more than 10,000 photos to pore over. Those photos allowed Lewis and Lafferty to document, for the first time, the interactions among the scavengers that fed on the corpse, led by the two magnificent carnivores seen in the photo above: brown bears and wolves. For four months, the carcass provided a rich source of meat for both carnivores. Altogether, between half and three quarters of the flesh and blubber was consumed by bears, wolves, and bald eagles before the carcass floated away in early September. The bears and wolves continued to visit occasionally for two years, gnawing on the remaining bones and scraps of blubber through at least November of 2012. Lewis and Lafferty published their findings recently in the journal Ursus. Brown bears are usually solitary, though they do occasionally aggregate around especially large food sources, such as dead whales and large salmon runs. What's uncommon, however, is to see brown bears sharing with other carnivores. They usually drive away other predators, including black bears and polar bears. That's why it's so interesting that this carcass was repeatedly visited by a pack of wolves as well. We saw little evidence of aggression between species—no instances of wolves attempting to displace brown bears and few instances of brown bears displacing wolves. ... Brown bears were present in >50% of the photos with wolves, indicating some level of tolerance. Smith et al. (2003) documented brown bears and wolves feeding and traveling together on several occasions at abundant salmon streams in Alaska. 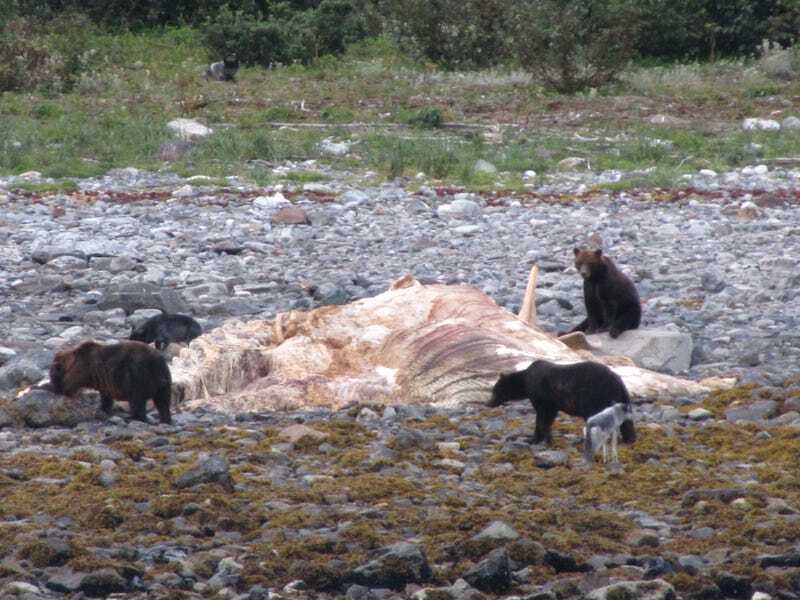 We observed similar tolerance between multiple brown bears and 7 members of a wolf pack sharing a humpback whale carcass and exhibiting similar diel patterns for [more than] 4 months. Our results provide supporting evidence that the frequency and severity of bear–wolf conflicts may decrease at large-magnitude food resources. Lewis and Lafferty suspect that the sheer abundance of meat and blubber offered up by the lifeless giant allowed the bears and wolves to coexist relatively peacefully. In fact, three of the photos they retrieved from their camera traps revealed bears and wolves feeding nose-to-nose.